Post subject: AUSTRALIA: Spring time! I love Australia in Spring because that the time when Jacaranda blossom. It's a native Australia tree. The first time when I saw this tree, I think I fall in love with Australia. Later on, I was dating my hubby around the same time of Jacaranda blossom. I have a lot of great memories around this beautiful tree! Me and my hubby took our girls - Ray and Soleil - to Hyde Park and Sydney Town Hall yesterday. Hope you enjoy the photos. And sorry in advance for my late response. My internet slow down to 64KB now (>_<)! Beautiful pics Blue. Your girls look so pretty and romantic at this spot. Ray looks like she is Soleils big sister. The alternate Summer Menuette clothes! They're more spring-like. Appropriate for this time of year in the land down under. That is a beautiful tree ... does it have a scent, too? i had always seen the name Jacaranda but never knew what it looked like. very cool! i also like how the momokos have an "opposites attract" sort of vibe going on. Thank you so much everyone for your kind words and lovely comments. melissa: Thank you I agree with you that Ray and Soleil are good sister. Accidentally, their names go well together too. They are both make out of light and sunshine. yoofsan: Hugs ^_^. 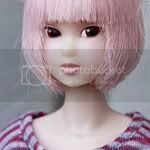 I'm happy to have momoko in my life! Post subject: Re: AUSTRALIA: Spring time! 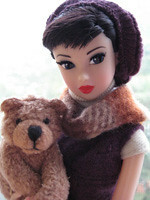 Wonderful pics bluesime Your dolls are beautiful here, very pretty pics!! I think you don't need the heaters anyway because you have such a warm heart! I hope my internet speed up soon too! !